The Cole-Parmer Masterflex L/S Peristaltic Pump provides precise control, variable speed and is an ideal choice for metered applications. This easy to use analog pump drive has a 1/10 hp motor that’s reversible alloing you to purge tubing before or after pumping, or to pump fluids in either direction. The Cole-Parmer Pump features smooth operation with a soft start and a back EMF for ±2% speed control. This L/S precision variable-speed drive has a speed range of 6 to 600 rpm, and a flow rate of between .36-3400 mL/Min. The simplified controls of this MasterFlex L/S Console Drive means integrating it into your lab is quick and easy and will be a work horse for years to come. 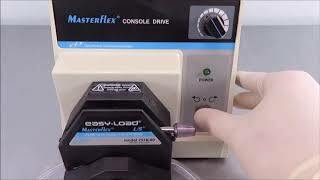 The Masterflex L/S Peristaltic Pump comes equipped with three-roller rotor Easy-Load pump heads, but is also compatible with Standard, Easy-Load II, Quick Load, High-Performance, Cartridge, PTFE-Tubing, PTFE-Diaphragm heads. This Cole-Parmer Masterflex L/S Peristaltic Pump 7520-40 has been fully inspected and is operating in both directions without issue. All of our lab equipment comes backed with our standard warranty. Should you have any question, please don't hesitate to contact us.